Hagerstown is situated in Jefferson Township in western Wayne County. Located approximately thirteen miles west of Richmond and ten miles east of New Castle, the community sits near the intersection of State Road 38 and State Road 1. Hagerstown is approximately five miles north of Interstate 70, and the town has rail access via the Norfolk and Southern railroad. The Hagerstown Airport also services the community and can accommodate small aircraft. The Cardinal Greenway section of the American Discovery Trail, a rails-to-trails program intended to eventually stretch from Maryland to the Pacific Ocean, passes through Wayne County a few miles north of Hagerstown. Both the Whitewater River and the Nettle Creek run through the community, with the Nettle Creek feeding Scout Lake just south of town. In the nineteenth century Hagerstown was the northern terminus of the Whitewater Canal, a major canal system which spanned seventy-six miles and was completed in 1847. Today, many elements of Hagerstown life have taken on the name of Nettle Creek, including the Nettle Creek School Corporation and the Nettle Creek Gazette. The Treaty of Greenville between the federal government and the Native Americans of the Western Confederacy was signed in 1795, and this treaty first opened the eastern part of present-day Wayne County to settlers. In 1809, the Twelve Mile Purchase pushed the edge of U.S. territory twelve miles farther west, drawing the boundary east of where Hagerstown lies today. Treaty Line Road, just south of Hagerstown, still runs along this 1809 treaty line. Though settlers began to move into the area by 1814, the land in and around present-day Hagerstown was not officially open for sale until after 1822. The Town of Hagerstown was laid out by Jacob Ulrich and Jonas Harris on March 8, 1832. The Town was named Hagerstown in honor of Hagerstown, Maryland, from where many settlers had migrated. Hagerstown was surveyed and platted November 15, 1832, and Jefferson Township was formed in 1834. Hagerstown was incorporated as a town on September 3, 1853. Early churches included the Salem Baptist Church, established in 1816, the Nettle Creek Church of the Brethren, organized in 1825, and the Methodist Episcopal Church, which started in 1840. The town continued to grow throughout the nineteenth century. The first school in the area was organized northeast of present-day Hagerstown in 1828. By 1832 a number of businesses and mills had been established, and a new post office was built at Nettle Creek in 1833. The Hagerstown Canal Company was organized in 1846, with Jacob Ulrich as president. The town’s earliest newspaper, the Western Budget, was established in 1852. A second paper, the Hagerstown Journal, began publication in 1865, but did not survive. Finally, the Hagerstown Exponent was established in 1875 by Alonzo Milton Dawson. The Exponent remained the source of local news for the Hagerstown area into the twenty- first century. Today, the community is served by the Nettle Creek Gazette. In 1860 the Hagerstown Academy was built as a permanent site for community education, and in 1863 a circulating library was formed in the basement of Watkin William’s Tailor Shop. The Hagerstown Telephone Company was established in 1899. Electricity was provided to the town in 1908, and a municipal water system was adopted in 1909. The town expanded quickly in the early twentieth century, and with new business opportunities came a need for greater educational resources. In 1921 the Hagerstown and Jefferson Township schools consolidated. Several more townships would consolidate and form the Nettle Creek School Corporation in 1962, resulting in the building of a new elementary and high school in 1968 and 1971, respectively. In 1929 the Teetor family gifted the new Jefferson Township Public Library to the town. Two new wings were added to the building in 1958 and 1990, and the library continues to serve as a central hub of town life today. The Hagerstown Museum and Arts Place, located in a historic building on Main Street, also furthers community education through its preservation of local history and offerings of fine arts classes. Businesses such as Perfect Circle, Abbott’s Candy, and Welliver’s Smorgasbord havealso left a lasting impression on the Hagerstown community. The history of Perfect Circle begins with the Teetor family in 1895, when, after developing a lightweight four- wheeled pedal railroad car, Charles Teetor transformed his family bicycle repair shop into the Railway Cycle Manufacturing Company. The company began manufacturing self-propelled inspection cars, and in 1900 was renamed the Light Inspection Car Company. Taking advantage of the Midwest’s movement toward automobile manufacturing, the company began producing car engines and engine parts. In 1907 Teetor’s business began casting piston rings individually, resulting in a superior quality product which quickly became popular. The company’s name changed once again, this time to the Teetor-Hartley Motor Company; it also adopted the trade name of Perfect Circle. The Dana Corporation bought Perfect Circle in 1963, and the plant closed in 1995. Ralph Teetor, Charles’ nephew, founded TEDCO (Teetor Engineering Development Company), which today manufactures gyroscopes and educational toys in Hagerstown. Ralph Teetor also invented the Speedostat, or cruise control, for use on automobiles. 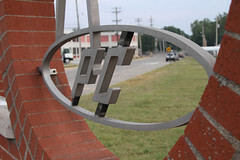 The automobile has continued to leave its mark on Hagerstown business and industry, as both Autocar and Precision Wire call the town home. Autocar, the nation’s oldest vehicle nameplate and a leading manufacturer of LCF Class 8 refuse trucks, opened its headquarters in Hagerstown in 2003. Precision Wire Assemblies, Inc., assembles wire harnesses at its plant in Hagerstown. Abbott’s Candy is another important business in Hagerstown’s history. In 1897, William Clay Abbott sold his Hagerstown restaurant to become a traveling salesman for the candy makers Dilling & Company. After some time, he returned to Hagerstown and began to make and sell his own candy, turning the garage behind his home into a candy factory. Abbott’s candies, particularly his caramels and butterscotch, became locally famous. After William’s death in 1942, his son, J. Bruce Abbott, and widow, Florence Abbott, continued the candy-making tradition. Bruce first introduced mechanization to the process, but his death in 1949 left Florence and Bruce’s widow, Rhea, to take over the candy business. Rhea introduced further mechanization to the factory, and in 1956 the women opened The Two Sisters gift shop on Main Street. Rhea’s daughter, Suanna Abbott Goodnight, took over the business after her mother’s death in 1988. Jay and Lynn Noel acquired the factory in 2012. Finally, Hagerstown is perhaps most well-known in the area for its local smorgasbord restaurant. After returning from World War II, Guy “Willie” Welliver sought to open a haberdashery on Main Street. After purchasing a location on Main Street—which was, at the time, set up as a restaurant—Welliver attended a “thrasher’s dinner” at his mother-in-law’s home. The following week he decided to offer a similar smorgasbord meal in his newly-acquired business. The restaurant was a success, and pan-fried chicken, shrimp, and cinnamon bread became a few of its signature items. Welliver’s Famous Smorgasbord remained family-owned until 2010, when it was purchased by local business owners Mike and Penny Wickes, who renovated and reopened the restaurant as Willie and Red's. After surviving a fire and the subsequent repairs and further renovations, the restaurant today continues to draw patrons with its extensive smorgasbord and menu options.